Why Sydney Can’t Get Enough of Yum Yum! | SOUL OF SYDNEY FEEL-GOOD FUNK SOUL DISCO vibes & beyond. Why Sydney Can’t Get Enough of Yum Yum! If their name doesn’t grab you then their smooth, ambient hip hop soul and jazz and funk grooves certainly will. 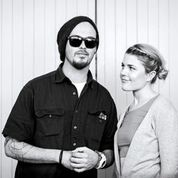 Sydney based beat maker Jayo James and vocalist Natalie Slade aka Yum Yum, are fastracking their rise in the live soul circuit and securing their position as the fresh new face in soul, dub, hip hop and delta blues fusion in Australia. With a debut EP titled “Jayo Meets Slade” and a support act touring roster working alongside the legendary US DJ, producer Tall Black Guy, Bankrupt Billionaires from Queensland, Triple J’s Hip Hop Show Host and pioneering Sydney artist Hau, plus a host of top local Sydney artists and musicians, Yum Yum have created a symbiotic movement between the perfect beat, melodic husky vocals and just the right amount of cool to be next big thing to emerge in the urban music ever evolving music industry.